If playing at home was something the Mystics could do all season long, then after their first three games at Verizon Center would lead to an amazing undefeated season… but with the play of Mystics today, it appears that they are going to do a lot of the same on the road as well. 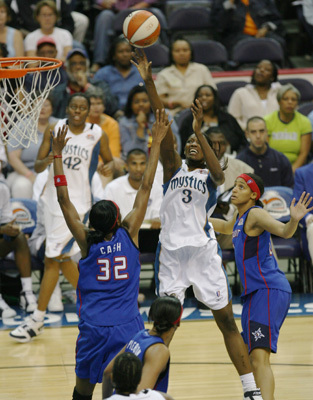 Today the Mystics faced one of the best teams in the league in the Detroit Shock and the combination of Delisha Milton-Jones ( 21 points) and Alana Beard ( 18 points) proved to much for the combination of Swin Cash and Deanna Nolan, who combined for a total of only 29 points today. The Mystics took a12-5 lead early in the first quarter and never looked back. At the end of the first quarter they had a 22-12 as Beard and Nikki Teasley scored seven points apiece. They Mystics led the game by at least seven points several times leading into halftime. The second half seemed to get even worse for the Shock and when the scoreboard and the the shot clock failed, it seemed that if Shock Head Coach Bill Laimbeer wanted his team to go home at that point. “I thought they should have called it: you don’t want to get anybody hurt at that point. Everybody’s getting cold, and to restart the thing after a 15- to 20-minute delay would have been difficult.” Laimbeer did not get his wish as league officials scurried and told officials to continue with stopwatches and a shot clock on the floor. The Mystics scored the first 16 points of the fourth quarter to take an 84-57 lead following a lay-up by Nikki Blue with 4:25 left in the game.